I finished my first wooden handled knife last week, and have been itching to post pics here, but wanted to wait until the new owner saw it first. 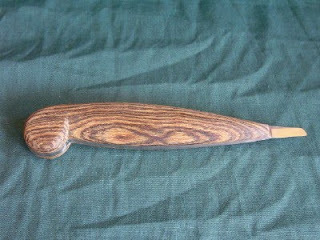 It was a commision, the blade design and wood for the handle were provided by the new owner, who allowed me to design the handle. I chose to keep the ball shaped end to the handle, a feature of my leather wrapped knives and sort of a signature for me. Neither of us is sure of the wood species, I suspect it is one of the -cote's, either ziricote or bocote. 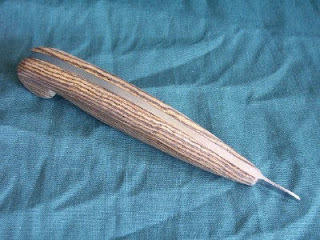 I had fun making the knife, shaping the handle, working with wood was an interesting break from my leather wrapped 'normals'. 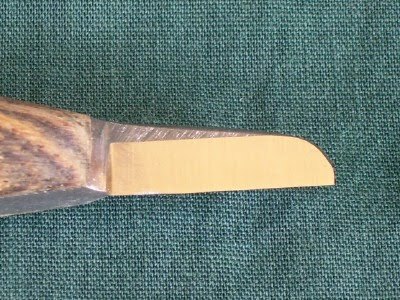 There's more to finishing the metal in a wood handled knife, grinding the sides flat so I had a good glue surface under the wood scales, and finishing the edges- all those parts are hidden by the wrapped handle. Pics are of the knife in it's unfinished state, the new owner wanted to do the finishing himself. I'm looking forward to seeing the finished pics. I've been planning this one for a while, maybe that is why it took so little time to do. Like all my whittlings, I tend to start and stop over the course of the project, but I figure this little one got done in less than an hour. It's Paulownia wood, I think its' interesting how the grain of the wood shows through the paint (really a wash coat, acrylic temper paints). I counterbored the bottom so the leaves of the calyx will hang down over the mouth of the bottle a little. 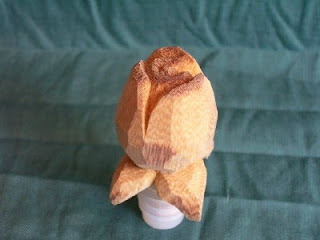 My vision was to imitate/emulate a glass or crystal faceted rose, I came close but did not quite pull it off this time. I'll try again, and i think I'll come closer next time. Why isn't it red? Yellow is the Rose of Eternal Love, according to one chart I saw early on in my married life. 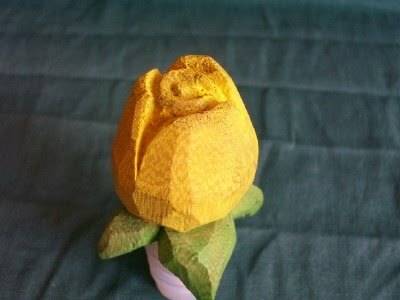 I've been giving my wife a yellow rose on our anniversary ever since. Floridian wood-carving artist Marlin Miller has fashioned over 50 sculptures for the Mississippi Gulf Coast area to boost tourism post-Katrina. His most recent gift was four wooden statues to the Jackson County Welcome Center on Interstate 10 Westbound, including the 6 foot tall eagle seen here. Four wooden sculptures, carved by artist Marlin Miller from trees knocked down by Hurricane Katrina, have been donated to the state of Mississippi and are now on display at the Jackson County Welcome Center along Interstate 10 in Moss Point. Miller, who lives in Fort Walton Beach, Fla., has carved many sculptures of area wildlife that are placed along U.S. 90 throughout Mississippi coast. He said that after the giant oak trees fell in the storm, Biloxi Mayor A.J. Holloway had the idea that the trees could be salvaged as sculptures. "So I came in around 2007 and did a couple, and people were so great about it and so excited that I just kept going back," Miller said. "Now, about two years later, there are about 50 sculptures through there. It was a way to bring them back to life and save them from the landfills." Miller said his previous experience with projects in the area, along with his desire to help the area in the wake of the Gulf Coast oil spill, is what led to the placing of the sculptures in the welcome center. "Somewhere the idea came up that we could put sculptures in that welcome center," Miller said. "Thousands of people come through there every day, and most don't even stop for gas to see what Mississippi has to offer. So maybe putting those small sculptures in there will work as a way to get them directed off the interstate and down onto Highway 90 to see what the coast has to offer. It might make it easier for them to route people down off the interstate and onto Highway 90, where they can see all the casinos, the fishing industry, the businesses and the beaches." One of the sculptures at the welcome center is a 500-pound, 7-foot-tall eagle with its wings pulled back above its head, but it does not compare to the 17-foot-tall eagle Miller carved and placed in War Memorial Park in Pass Christian. It's the world's largest eagle sculpture. 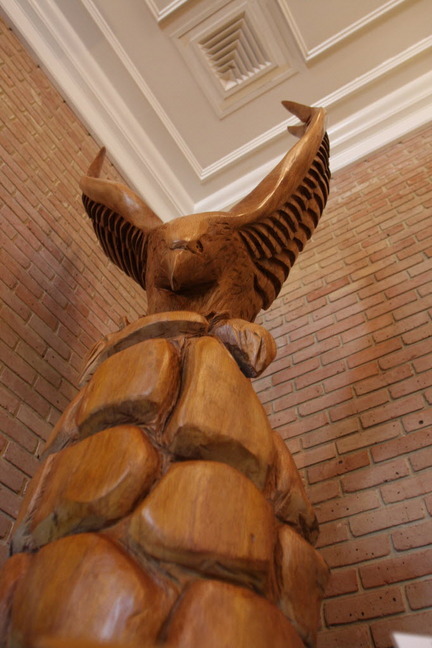 "The eagle in the welcome center comes from a giant oak tree that was part of the trees cut down on the coast from when I made those first sculptures, so he's actually made from those trees on the coast," Miller said. "And I think he'll serve as a great appeal to route people down if you say, 'Hey, there's an eagle down there that's 10 times the size of this one.'" Next to Miller's sculptures at the welcome center, a TV plays a looped video of his first "NBC Nightly News" and "Mississippi Roads" television appearances. "'NBC Nightly News' has been here to film me two times in the last 14 months," Miller said. "The people at the capitol get excited about those segments, because they have such a large audience. "Anytime you can throw something into 10 million households, that's a pretty exciting deal, and you can't talk about these projects without bringing up Katrina and the area's recovery from it." From time to time I come across articles like this, wood carving stories worth sharing. I'll post them here for the sake of diversity, and because I don't whittle enough myself to properly fill the blog. Stay Tuned, and Happy Whittling.